Welcome to The Game Plan! 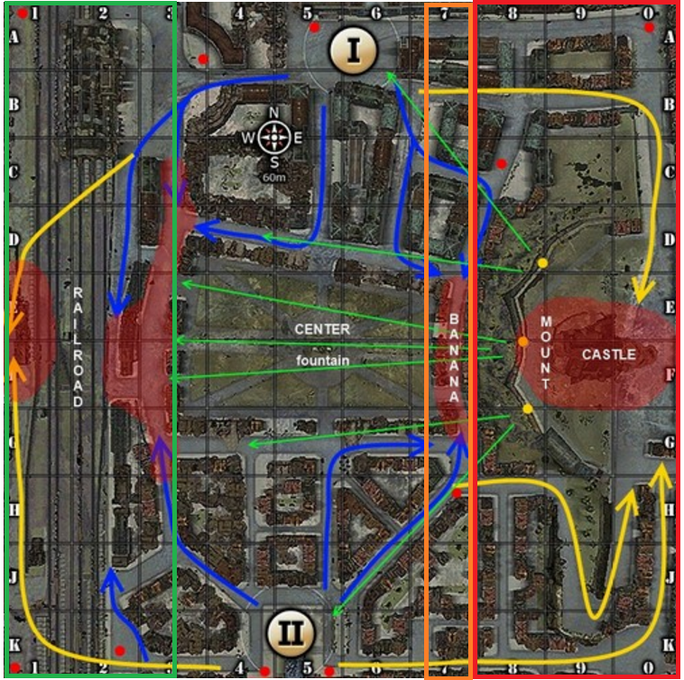 Map knowledge has always been a crucial factor in winning any battle, especially on a city map like Himmelsdorf, where narrow lanes and high buildings make it easy for a solo tanker to get cornered and gunned down. So don’t go alone! Take your teammates and this guide with you, and let CowdyWing and On9999Son from RUN show you how best to approach this popular tournament map! 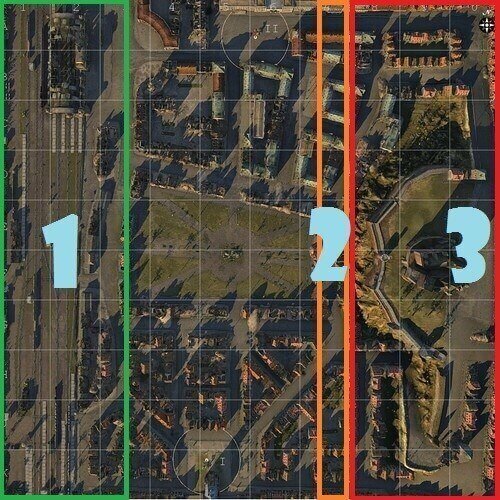 To help players better understand the map, RUN will be creating a series of map strategy guides. We will be focusing on random battles and competitive play. Movement on the map has always been one of the deciding factors in World of Tanks. Players need to understand not only their tanks, but the terrain of the maps as well. Today we will be discussing Himmelsdorf. For the record, this map has been around for a very long time. Not only is it commonly used for competition, but many new players will also do battle here. Veteran players may recall the good old days when they could charge into the centre square without worrying about tactics. Lane 1 and 2 can cover each other effectively, but Lane 3 is one big isolated warfront: players can only snipe from the hills, so if both teams are close in terms of skills, the hill doesn’t provide much support to allies in town. Due to the high amount of cover in town, contemporary tactics focus on staying mobile on Lane 1. In random battles, 3 - 4 tanks should be able to control this lane. But holding Lane 1 doesn’t guarantee success. World of Tanks is a pretty balanced game, so taking one lane doesn’t doom the opposition – they can still come back from the 2 other lanes. 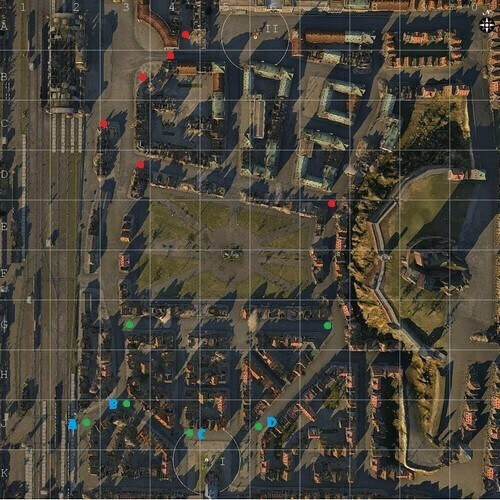 In small city maps such as Himmelsdorf, one can position 2 to 3 large-calibre tank destroyers or heavy tanks in the corners on defence, while other more mobile tanks can go exploit the weak spots behind enemy lines. The following positions are effective choke points to block off the enemy. Be sure to use cover and don’t trade HP lightly. The purpose of defence is to buy time for your teammates, not to kill the opposition, so be more passive. If you can coordinate with your allies to form a crossfire, that would be even better. Using the following diagram as example, if our Heavy Tank holds B while a Tank destroyer sits at C, then if the enemy attacks B, the Tank Destroyer could provide effective fire support. Or, for heavily armoured Tank Destroyers such as T95 or JPE100, they can go cover B while a Medium Tank covers their rear to protect them from flanking. This will ensure a sturdy defence that will buy your allies time for a breakthrough. Be sure to look at the map to find places where you can fight with numerical advantage. Stay on your toes and be nimble. Be sure to attack the enemy base if you’re able to shake things up. Here's wishing you good hunting! Stay tuned for more map guides from RUN!